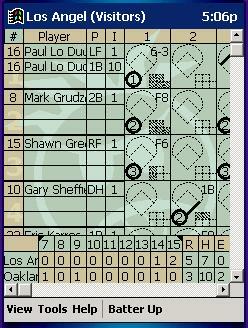 Easily score baseball & softball games play-by-play on your handheld Pocket PC. This is where you enter your name and serial number that you'll receive if you purchase Pointstreak K-ForCE. Entering the serial number allows you to save games. To evaluate the demo version, click OK to get past this screen. The main window is where the batting order is entered. Don't worry, you won't have to type in all that information every time you score a game. Once the team information is entered once, you can select from a list. This is also where you can see the scoreboard or make pitching substitutions. The user is holding the stylus down over the '1' representing the pitcher. Matt Herges is the current pitcher. 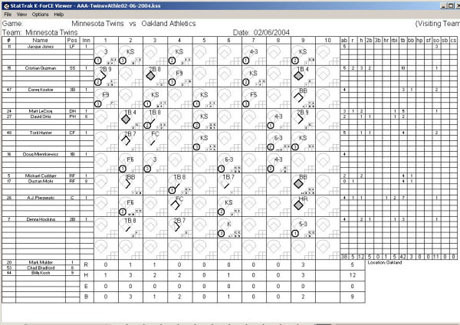 You can see Terrence's previous at bat summary: Fly out to left, Strike out swinging, etc. The batter has received 5 pitches so far this at bat: ball, called strike, foul, ball, foul. From the main window, you can bring up the statistics summary including batting, fielding and pitching. If you choose to track season stats, they appear here as well. Pointstreak K-ForCE includes a desktop viewer feature. 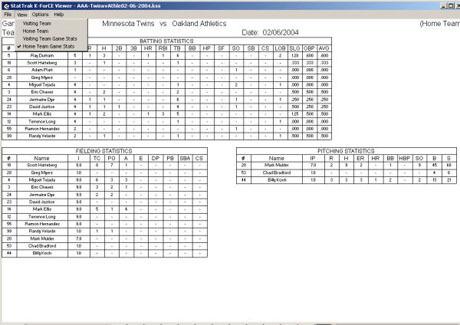 After you've scored a game, view and print out the summary score sheet from your desktop computer using the viewer. 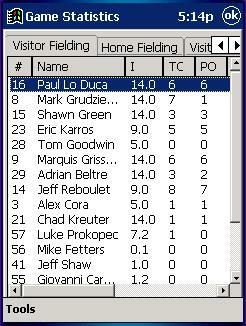 View and print out game stats from your desktop computer. If you're interested in more robust reporting capabilities, see our StatTrak for Baseball software. Import games from K-ForCE into StatTrak for Baseball on your desktop computer and you'll have lots of reporting options.